The screen structure of SU Walk is very simple. The screen is divided into four sections - pull down menu, icon tool bar, work area and status bar. Please click here to examine detail about mouse and keyboard controls. Please click here to examine detail on the Status Bar. Open Opens a BWA file format.. BWA file is the SU Walk native file format. It is similar to a project file. You can save a SketchUp model in SU Walk as a .bwa file. Open this format is faster than importing a SketchUp file. Import SketchUp File Opens a SketchUp or .skp file. Save Saves a file as BWA format. This is like a project file. Save As Saves a file as BWA format with a different name. Preferences When you select this, the System Settings dialog appears (See below). Anti alias Adjusts the details of how the model is displayed. The higher value requires more GPU power but is has greater in display quality. 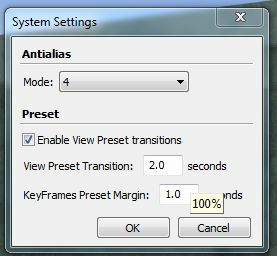 Anti alias settings - 2, 4, 8 or 16. 4 is set as a default. Greater value makes the display precision higher, but the display speed and the control movement will get slower. Preset Controls the playback blank which is created in the animation. Shadow Switches the light effects. Please see below for more detail. Edge Displayes lines at the edges of faces. Polygon Reduction Sets the limit of polygons to be shown. This is very useful if you want to reduce the SketchUp model size for quicker animations. Photo realistic Mode Turns off or on photo-realistic mode. If you want to create fast animations without reflections or artificial lights, non photo-realistic mode is useful. Polygon Reduction is very useful if your SketchUp model is very large and you want to create a quick animation with less quality. Polygon reduction can be very effective with non photo-realistic animations. 1 makes the display and the movement slowest and 5 makes quickest. You can switch from photo-realistic to non photo-realistic modes. Non photo-realistic mode is described in the main help section. If you want to create animations that do not need real time reflections or artificial lighting, use non photo-realistic mode. Background Opens the Background Setting dialog. Fly Mode - A mode without considering gravity. There is no collision to any objects. View point height is ignored. Walk Mode - A mode that simulates walking on the ground. This considers gravity.This mode detects collision. You can You can Jump by using the space bar. The view point is always located at the view point height except when using jump. On Always show shadows while moving through the model. This mode will display real-time shadows, reflections and light. On When Stop Hides when moving. Head Light Changes to the light from the camera. Turn Edges on if you want to display lines at the edge of surfaces. Click this icon if you want to move your camera to the original position of the SketchUp model that you imported. Click this icon to create a screen shot of your display. Very useful for creating images. However, keep in mind the resolution of the image will be equal to the resolution of your monitor view port. Most monitor's have a DPI resolution of 75 which is not suitable for printing. - Mode Sets the background mode. You can select between the texture mode and the simulation mode. Depending on which mode you choose, the Type options will change. 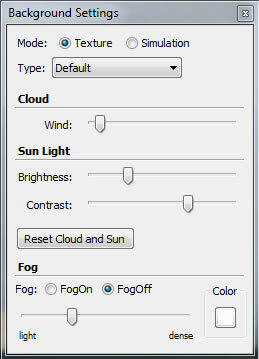 - Cloud When Simulation mode is on, you can adjust the wind speed which affects the cloud, snow and rain. - Sun Light Sets the brightness of the sunlight in the scene.When you change the Type, the Sun Light will also change. The entire scene brightness is adjusted by Brightness and the entire scene contrast is adjusted by Contrast. - Reset Cloud and Sun Resets the settings. - Fog Sets to show/hide fog.On-shows and Off- hides the fog. - Color Sets the color of the fog. - light-dense Adjusts the density of the fog. 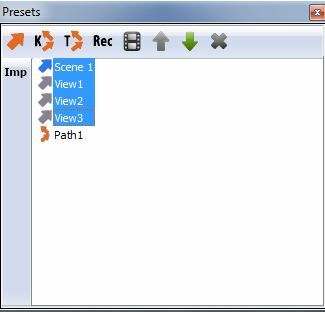 The IMP symbol on the left of the Presets dialog box refers to importing SU Animate camera paths. If you have created SU Animate, you can import the SU Animate animation path directly without having to import all the SketchUp scenes. Please click here to examine details about mouse and keyboard controls.